I use STAINLESS STEEL saucepans and frying pans. I like the ones with the stainless steel handles as the plastic handles often get too hot if positioned on top of a flame and toxins start spewing out into your home environment. Also plastic handles mean that you can't put the frying pan under the grill when making omelettes, and pancakes as the plastic may start to melt. I’m a traditional cook, so I avoid all non stick cookware. Period. However natural they say the non stick surface is, its not going to be as natural and non toxic as stainless steel. “But what about things sticking to the surface?!?! ?” I hear you cry. Well my answer to that is FAT. And a lot of it. Read on…. I cook with lots of NATURAL FATS which go a long way to prevent things from sticking. The low fat, non stick frying pan movement peaking in the 1980s has a LOT to answer for as people (myself included) reduced their natural fat intake and started using cookware that potentially leaches chemicals into their food😤😷. Using stainless steel cookware practically forces you to revert back to using fats to cook with and provided you’re using only traditional natural fats (like butter, beef tallow, pork lard, duck fat or ghee), you’ve got a Win Win! When reheating food in saucepans (instead of microwaving!) I simply add a little bone broth to the bottom of the saucepan to prevent the food from sticking. Reputable brands are Scan Pan and Acro Steel. (And no I don’t get any kickbacks from these companies. I just dig their stuff). 2. I soak cookware in hot soapy water STRAIGHT AFTER I use them so food matter just slides off when I get around to washing them after eating. 3. 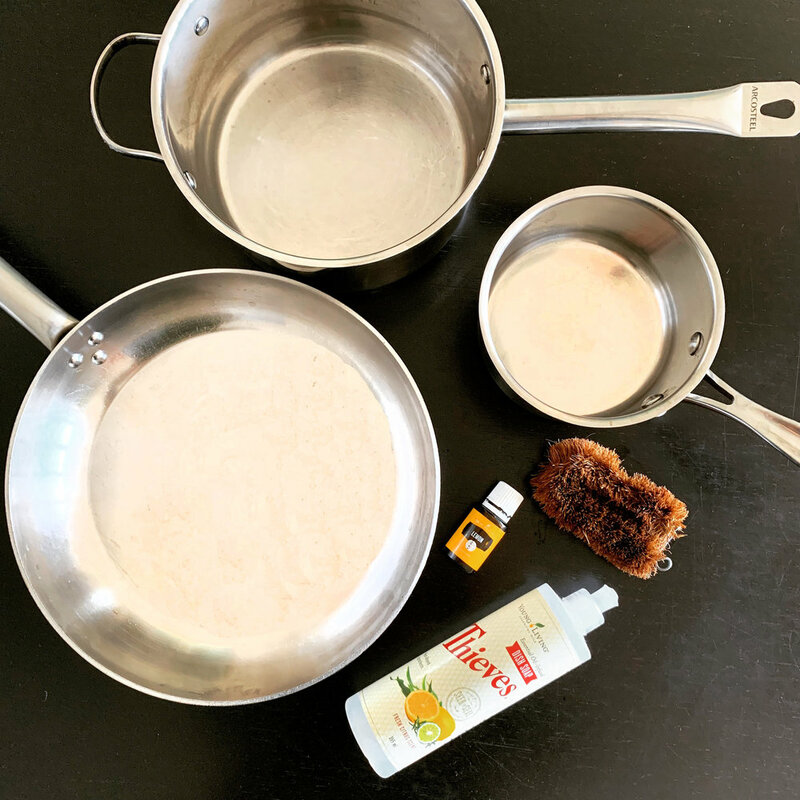 I use a 100% natural eco friendly coconut husk kitchen scrubber to clean my frying pans and pot from Import Ants (combined with a bit of elbow grease – let’s face it brut force is sometimes needed). Granted, the conventional wire scourers are very effective but I eventually (and somewhat begrudgingly) gave them up as they are indeed an ecological disaster (the bits of wire break off, end up down our drain, into the mouths of fish and then we eat the fish 😷). Future generations and environmental sustainability takes precedence (in my mind anyway) over any aspirations for my pans to have mirror-like reflective surfaces. My mum would disagree. With all due respect, she’s of a different generation. 4. I use Young Living dishwashing liquid because it’s SUPER CONCENTRATED, non toxic, all natural and very economical ($0.16/wash). For slow cooking I love using cast iron pots made by Le Creuset or Le Chasseur (you can certainly use cast iron frying pans and saucepans but I find them way too heavy for day to day use). Cast iron is not cheap, but a valuable investment that will last a lifetime (or longer). People with haemochromatosis (excessive iron) should avoid using cast iron. I also own a non-lead Sunbeam slow cooker but much prefer the cast iron pots as I’m a traditional cook and prefer the more intense flavour they provide…plus they look so much prettier…I’m a girl after all ;-). If you do use a slow cooker ensure that the insert is non-lead. Hope you thought this little post was helpful. Wishing you Kali Orexi (that’s Greek for good appetite!). PS if you’re keen to make your own slow cooks, bone broths, organ meat dishes, and gluten free nutrient-dense cakes, check out my game-changing online workshops (solid individually or as a bundle). Food As Medicine Tour: Take Inspired Action NOW! Halloween healthy trick or treat bags! !